Chennai Super Kings Skipper MS Dhoni's wife Sakshi was spotted during the IPL 6 match at MA Chidambaram stadium in Chennai. Sakshi Dhoni, undoubtedly the first lady of Indian cricket, seems to have passed on her luck to her husband's Chennai Super Kings. Sakshi has been making fashion statements. And Sakshi's pink lip colour stole the show. 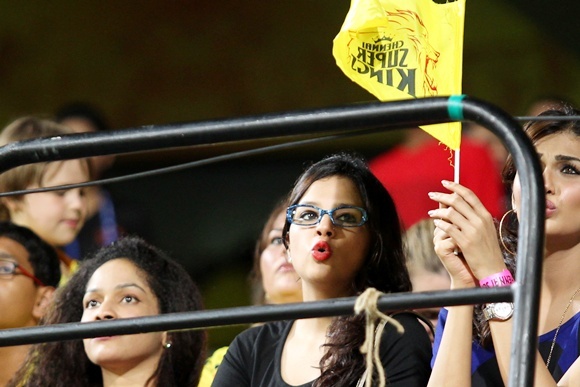 Sakshi makes sure she endorses CSK's jersey colours in some or the other way. In one of the matches she held a bight, sunny yellow paper fan close to her, while this time around she sported a yellow bangle. 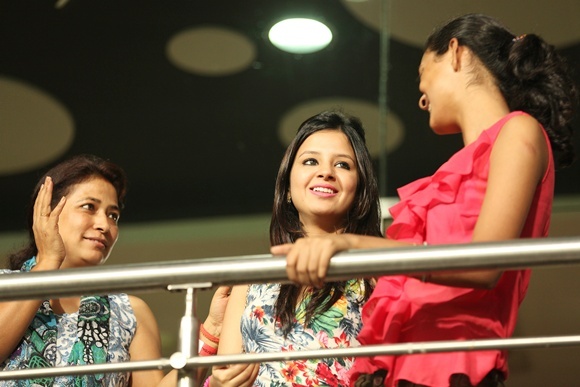 After wooing thousands of fans with her choice of lip colours, Mrs Dhoni's was again spotted in a floral dress. Sakshi is giving serious competition to Bollywood beauties. Sakshi's expressions tell it all! Chennai Super Kings led by her husband Dhoni won the match. Stylish Sakshi makes it a point to attend all IPL matches. Mrs Dhoni is seen passionately cheering for her husband's team. But when they lose, Sakshi is gloomy as ever!